Chief Michael Murphy first volunteered for Fire Co. #3 on July 10, 2000. He worked his way through the ranks holding positions of Lieutenant, Captain, Assistant Chief, and Deputy Chief and is currently the chair of the Uniform Committee in addition to Chief. Chief Murphy has been actively engaged in the construction and design of new apparatus. He is also an advocate of safety ensuring the members of Volunteer Fire Co. #3 have everything necessary to accomplish the job of a firefighter safely and efficiently. One of Chief Murphy’s biggest accomplishments was directing and leading his son Ryan Murphy to achieve his dream of becoming a firefighter through Fire Co. #3 and is currently a career firefighter in Myrtle Beach, South Carolina. 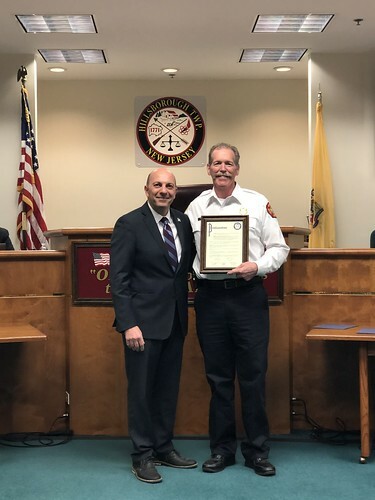 The Hillsborough Township Committee recognizes Chief Michael Murphy for his outstanding service to the residents of Hillsborough as Chief of Fire Co. #3 and wish him well in all of his future endeavors.